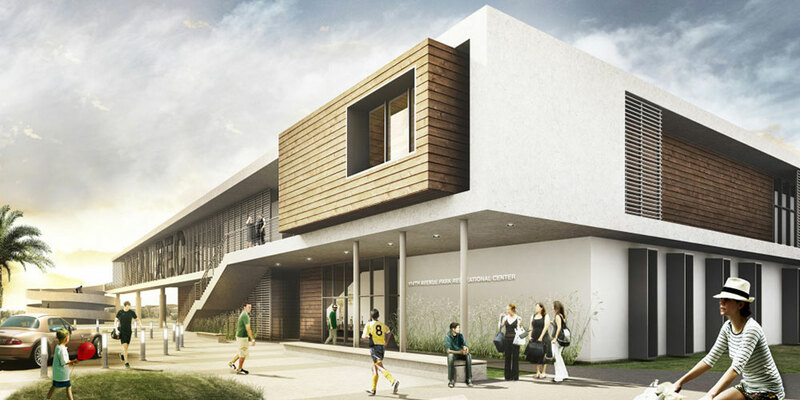 A new recreational complex which will provide the city of Doral with a 35,000 sf recreational building, community park, and sports recreation facilities. Community gardens, playgrounds, a large splash pad, civic lawn, band shell, shelters and a nature walk are among the many components that will provide the community with a safe and active environment for all ages. The park, which is divided into two unequal areas by a city street, is one of the site’s most challenging conditions. A covered pedestrian bridge was designed as an active and passive strategy to take advantage of this potential issue. The bridge extends from the recreational building and provides a safe passage above a busy city avenue. It also doubles as a city gateway that defines the northern boundary of the city.